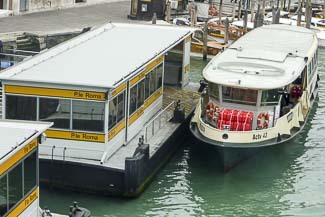 In the photo above, you'll see two pontili, or pontoons, at one of several vaporetto landings next to the Piazzale Roma (where Venice's airport buses and land taxis arrive). The floating platforms have benches inside where passengers can wait for water buses. Some stops have ticket booths, ticket vending machines, or both, while others don't. Here's what to do if you arrive at a waterbus stop without a ticket or a pass such as the Tourist Travel Card. 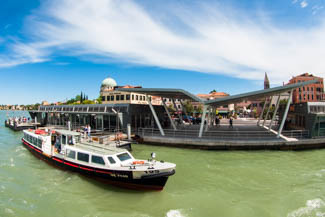 At a few larger stops, such as San Marco Giardinetti, Lido Santa Maria Elisabetta (shown above), and the Pietá substation at San Zaccaria, ACTV has built large new stations with ticket offices, waiting rooms, and either traditional floating platforms or modern boarding piers. 2. Look for an electronic ticket reader on the walkway leading to the floating platform or a the entrance to the waiting area. 3. Hold your ACTV waterbus ticket or Tourist Travel Card up to the electronic reader and wait for a "beep" and the flash of a green light. Keep your ticket or travel card handy in case inspectors are doing spot checks on the the water bus. Note: As we mentioned above, smaller stops don't always have ticket booths or vending machines. If you need to board a water bus without a ticket, follow these instructions to avoid a fine.